Tyrant Ransomware is yet another malicious program that you should delete without any hesitation if it is ever found running on your operating system. It is crucial to keep your PC safe at all times because this devious application is designed by cyber crooks so they could make illegal profits. The scheme is quite simple; once the malicious program enters your operating system it locks a vast amount of data without any warning, then the user is asked to pay a ransom in return for decryption procedure. It goes without saying that having this malware active on your operating system can have devastating outcomes, to put it middy. Find out more about the complex inner workings of this ransomware. Additionally, we provide a few virtual security recommendations that will help you keep your PC secure at all times. To delete Tyrant Ransomware once and for all, make use of detailed instructions that we present below. While Tyrant Ransomware appears to be targeted at users located in the Middle East, there is no guarantee that it would not spread elsewhere. Therefore, it is critical to be aware of this malicious program's existence at all times. Once the ransomware in question gains access to your operating system, it immediately starts doing its dirty work. Before it starts locking your data, it scans your hard drive for its contents. During the in-depth analysis, our malware experts have discovered that this malicious application locks files located in the %USERPROFILE% folder and its subfolders. Due to this, you will likely lose the ability to use quite a few of your applications. Unfortunately, the encryption process is completely silent, which means that most users are not aware of what is going on at that moment. Each file affected by this ransomware will be appended with the .crypted extension. It is important to note that this malware uses a powerful cipher to lock your data; thus, manual decryption is not a possibility. Once your data is no longer accessible, you will be presented with a ransom note, which will block your desktop. Our researchers highly advise you not to carry the demands in return for alleged decryption services since cyber crooks responsible for this malware are not legally bound to unlock your data even if you abide by their demands. Make sure to execute a complete removal of Tyrant Ransomware as soon as it is found up and running on your personal computer. To do that quickly and easily, use the removal guide that we present below. If you are a security-conscious user that wants to have a clean and secure operating system at all times, you must take preventative steps, which will improve your virtual security. It is critical to be careful while surfing the web at all times. We urge you to stay away from all suspicious download sites at all times because they tend to host bundled installers, which are known to be dangerous because they are often filled with questionable and otherwise dangerous programs. Furthermore, make sure to read as much as you can about a program that you wish to have running on your personal computer. We recommend doing so because malware developers are known to use manipulative marketing techniques to lure users into downloading their suspicious applications. While practicing such safe browsing habits will significantly reduce the risk of coming across devious installers, you must also have a reliable antimalware tool active on your PC. Such a tool is crucial because it can identify and remove any virtual threat in a fully automated manner. Take these preventative steps, and you will be able to maintain a fully secure operating system at all times. 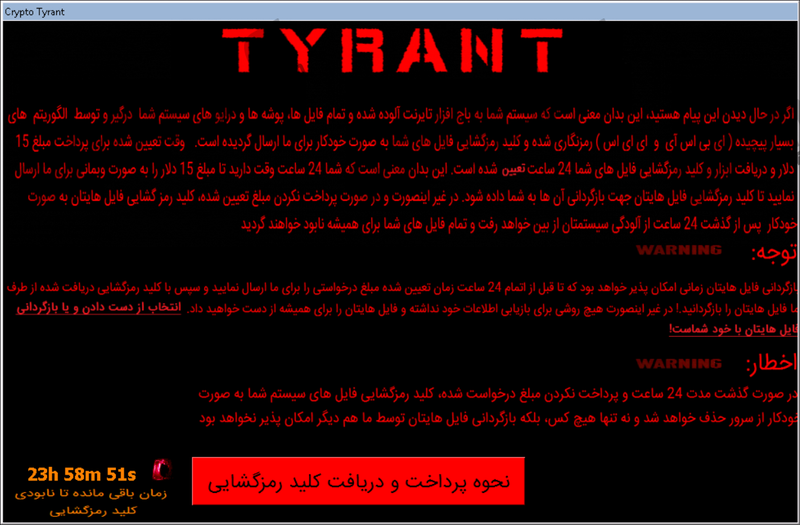 It should be more than obvious that you must remove Tyrant Ransomware without any hesitation. It is important to note that you must delete every single bit of this malicious program to stop its devious functionality once and for all. Therefore, we highly advise you to double-check your operating system for potential leftovers related to Tyrant Ransomware. It is critical to do so because traces of this malware might be used for it to continue its malicious functionality. In other situations, leftovers might trigger a restoration of this ransomware without your knowledge. You can also scan your operating system with a professional antimalware too because it can detect and delete any traces of Tyrant Ransomware in a fully automatic manner. Quick & tested solution for Tyrant Ransomware removal.